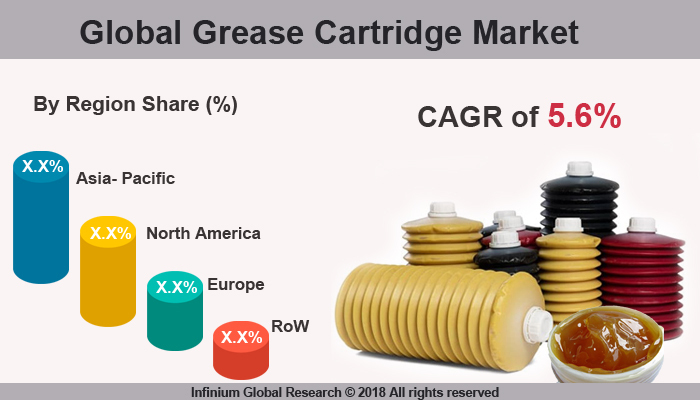 A recent report published by Infinium Global Research on grease cartridges market provides in-depth analysis of segments and sub-segments in global as well as regional grease cartridges market. The study also highlights the impact of drivers, restraints and macro indicators on the global and regional grease cartridges market over the short term as well as long term. The report is a comprehensive presentation of trends, forecast and dollar values of global grease cartridges market. According to the report, the global grease cartridges market is projected to grow at a CAGR of 5.6% over the forecast period of 2018-2024. Grease cartridges are extensively being used for the storage of greases as they are extremely advantageous as compared to conventional formats of grease packaging. Grease cartridges are generally made of plastics tube or aluminum and store grease inside it. It is used in the grease gun to lubricant the machine. In the recent past, there has been a shift in demand from traditional fiberboard cartridges to plastic cartridges as most of the lubricant manufacturers across the globe are opting for plastic cartridges. Such transformations are due to high paperboard prices, which are generally used for manufacturing fiberboard cartridges, leakage problems and durability concerns related to the product. Furthermore, plastic grease cartridges have been witnessing growing preference in past few years due to their rigid structure, which reduces the risk of leakage, as in the case of fiberboard cartridges. Plastic cartridges are rust resistant and can also reduce the leakage of grease from fiberboard cartridges during logistics and shipping. The demand for plastic grease cartridges is expected to increase over the forecast period. The growing preference for lubricating grease in the automotive and mining industry is boosting the growth of the grease cartridges market globally. Additionally, grease cartridges reduce human efforts while applying grease for machinery parts. Consumers are moving towards convenient products for lubricating. Manufacturers are coming up with various innovative lubricant packaging solutions to expand their market and cater to the growing needs of the consumers globally. The Asia- Pacific region is expected to lead the market in terms of revenue generation due to the increasing need of lubricants for the automobile industry, and growing preference for high-grade grease lubrication to maintain equipment for the longer time. Additionally, growing automation in every field requires timely greasing of the machine, that is helping to grow this market in this region. The report on global grease cartridges market covers segments such as capacity, material type, and closure type. On the basis of capacity, the global grease cartridges market is categorized into 0-10 OZ, 10-20 OZ and above 20 OZ. On the basis of the material type the global grease cartridges market is categorized into plastic, fiberboard, and market attractiveness analysis by material type. On the basis of closure type, the global grease cartridges market is categorized into pull-off, piston cap, flat cap and spouted. The report provides profiles of the companies in the global grease cartridges market such as Fischbach KG, MBP Manufacture Bourguignonne de Plastique, Biederman Enterprises Ltd., Sonoco Products Company, Tubi System AB, Schieferdecker GmbH & Co. KG, Plastic Tooling Manufacturing Pty. Ltd., Long Thames Enterprise Co., Ltd., Andpak Inc., and Bev-Cap Pty Ltd. The report provides deep insights on demand forecasts, market trends, and micro and macro indicators. In addition, this report provides insights into the factors that are driving and restraining the global grease cartridges market. Moreover, IGR-Growth Matrix analysis given in the report brings insight into the investment areas that existing or new market players can consider. The report provides insights into the market using analytical tools such as Porter's five forces analysis and DRO analysis of grease cartridges market. Moreover, the study highlights current market trends and provides forecast from 2018-2024. We also have highlighted future trends in the grease cartridges market that will impact the demand during the forecast period. Moreover, the competitive analysis given in each regional market brings insight into the market share of the leading players. This report will help manufacturers, suppliers, and distributors of the grease cartridges market to understand the present and future trends in this market and formulate their strategies accordingly.